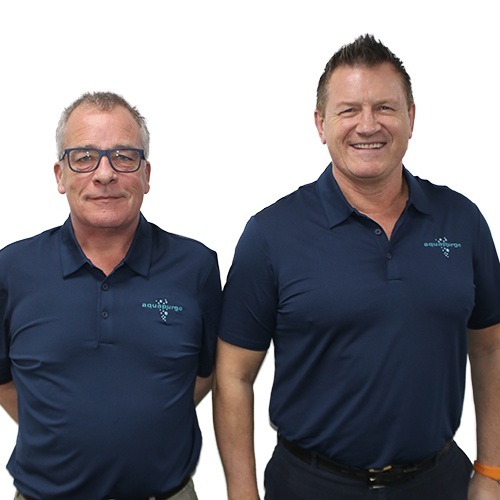 This year is Aquapurge’s Silver Jubilee and for the past twenty-five years John and Richard have been counted among the movers and shakers in UK plastics. There is no facet of this sector in which their company has not played a leading role – the very first Plastics Industry Awards, the first Plastics Design and Moulding (PDM) exhibition; regularly showing at the UK’s triennial Interplas exhibition, and - for some years now - a valued council member of the British Plastics Federation. And now, thanks to a recent reset of the company’s business aims, Aquapurge is set over the coming years to become the leading global name in plastics purging compound for the world. 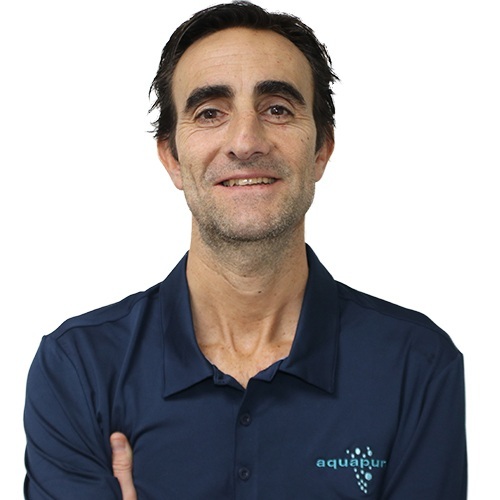 Right now the Aquapurge appetite for new business - export-led - has never been stronger and the company’s future prospects have never been more exciting. Outside of work, shared interests in family, sport (rugby union rivalry); and travel accompany an outgoing style that has John and Richard moving smoothly through the gears and keeping the company style as fresh and lively as the first day of business. Watch this web space for news and views from both John and Richard as the company steadily expands its production and its global business network and reach. 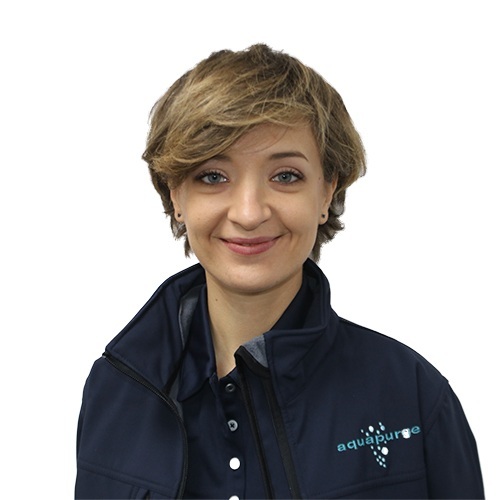 Donatella Isopi is Aquapurge’s European sales manager and has led the six-fold growth of the company’s sales there over the past three years. She has a Master’s Degree in Industrial Engineering from the University of Rome “La Sapienza”. 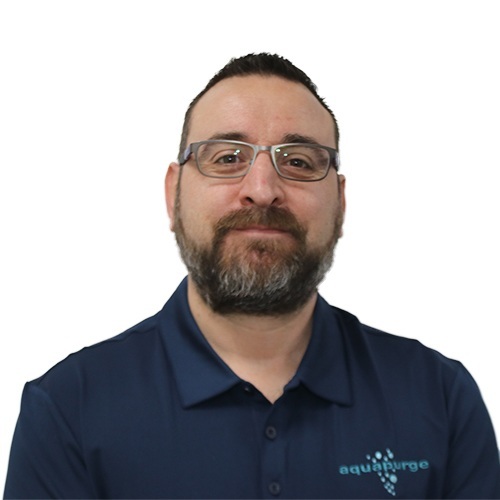 This industrial discipline, combined with a deep understanding of contemporary continuous improvement (CI) methods, allows Donatella to quickly identify key productivity issues for Aquapurge clients and to also help train Aquapurge representatives to do the same. Donatella brings determination, reliability, and a very large helping of Italian passion and enthusiasm to her work – most often bringing these qualities direct to the customer’s front door. Outside of work she counts acting and running as extra enthusiasms. Look out for a personal best 20k road performance this year and a starring role in a leading stage passion play. Barry has in excess of 25 years' business-to-business (B2B) sales experience – twenty plus in the automotive aftermarkets and six years as sales manager for a disability equipment manufacturer. Barry’s clients have included individuals, Local Authorities, the NHS, small and large business accounts, major buying groups and multi-nationals. Product ranges from FMCG retail to long-term business partnerships, (for major Motor Franchises), and bespoke products to fulfil individual needs. Outside of work, Barry has had a long-term love of all things motorcycle	and regularly rides his own for enjoyment. He was part of Pirelli’s first TT winning team. His track record has seen him working for some well-known brands across both the Public and Private sectors in the UK and further afield. Tom’s focus is always the customer; going the extra mile whenever needed and always on hand to offer advice and support. 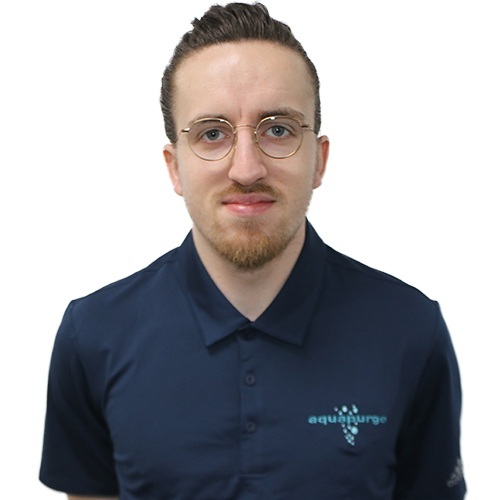 Today Tom is increasingly focused on increasing efficiency gains for his new and current customers alike in order to provide the best solution and service. Outside of work Tom is very much a family man, spending time with his wife and two children and the occasional pint or three with friends. 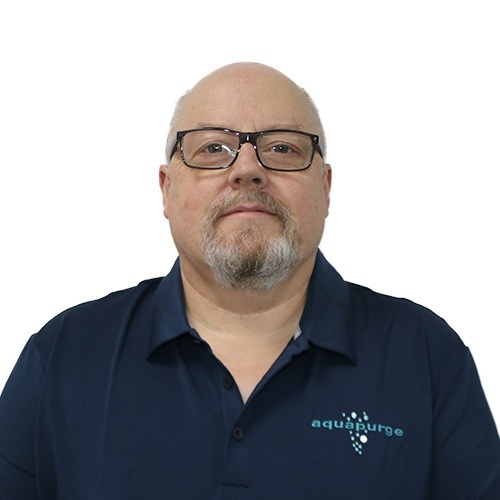 Steve Dix has some 30 years of experience in plastics - starting life at Silleck Mouldings (laterly CTP Silleck), then Ninkaplast (Mollertech) , Stadium Plastics, Hashimoto (Faltec), Summit Systems and now with us at Aquapurge. 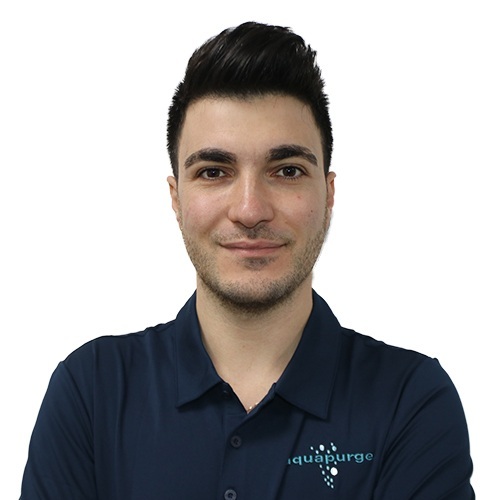 Steve moved back to his Northern roots just over a year ago and is on the Aquapurge team to grow new accounts and to also nurture our existing clients in the North East. Steve’s extensive industrial experience is supporting by a Polymer Science degree at Northumbria University and prides himself with honesty, integrity, never shying away from a challenge. When not at work, Steve makes the most of the great outdoors with his family. In fact, 2019 sees Steve taking on a few tough mental and physical challenges, including the likes of Total Warrior, The Bob Graham Round and Man versus Mountain. Has extensive academic and industrial expertise, primarily gained in college and industry throughout France over the past decade. He holds a Master of Science in Business Engineering from the École Supérieure des Technologies et des Affaires, France. His industrial experience in France includes spells with Sony Alsace Tec. Etienne is a problem solver - interested in cars and in contemporary entertainment technologies. The pinnacle of the job for him is helping customers solve their problems through all the process of a difficult journey - eventually arriving in a better place with much improved methods and solutions. He likes travel time with family and friends, good company, good food and drink. He and his girlfriend have a cat - named Cat. Gerado is a highly experienced technical sales manager, working in Spanish industry and finance. Currently based in Madrid, Gerado began his career in the financial sector, working with JP Morgan and then moving into nineteen years of experience in B2B sales. Outside of work Gerado’s interests include tennis, biking, surfing, trekking, books, cinema, family and friends. Oscar has been growing the Italian Aquapurge market since 2017, mainly across the automotive, healthcare, cosmetics, and pharmaceutical sectors. More recently, he organised Aquapurge’s first-time exhibition at PLAST 2018, Italy’s premier triennial plastics exhibition. The event paid for itself within months and the Italian plastics processing sector continues to reap the benefit and savings using Aquapurge compounds. Oscar holds a Business degree from the University of Catania, Italy. 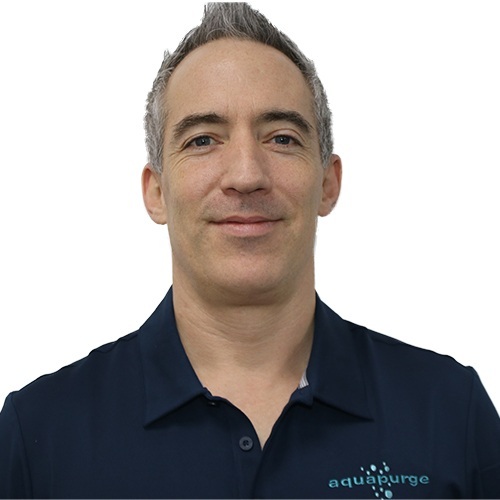 Prior to joining Aquapurge he lived in Manchester, UK, and covered roles in customer service and retail. If you don’t see Oscar visiting clients, he’s probably gone to capture landscape, nature and people’s moments with his professional camera. Italian cooking is always on the menu. After those guilty pleasures a gym workout is invariably in order.